Are you one of those people who posts something on Facebook and then watches closely to see how many “likes” it gets? 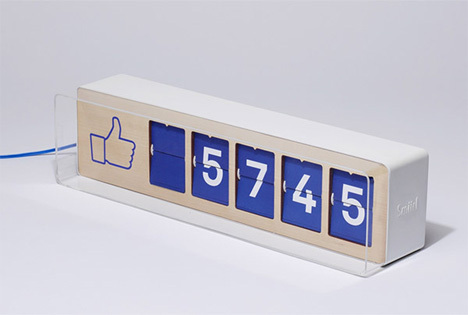 Fliike is a physical counter that lets you keep track of exactly how many people clicked that little upturned thumb. Designed by French design studio Smiirl, the Fliike features a flipboard face that looks a bit like a retro clock. The device gets its information from your Facebook page over wi-fi and shows the “likes” on its face. While certain heavy Facebook users might want to count their online popularity with this gadget, it’s meant mostly for businesses to show how popular they are on the social networking site. We can imagine this leading to a strange retail situation in which people will choose which stores to go into based on the numbers on the stores’ Fliike counters in the window.